New ! Third edition just released . . . Praise for . . . This empathetic, inspired author steps into the humble place of the convent, dons their clothes and feels what it is to walk amongst the poor. Emily Isaacson, in Hours From A Convent, takes you to the depths of the Poor Clare Nuns' spirituality as they reach out to the wounds of the lonely and brokenhearted. This is a journey of compassion in poetic form well worth pondering. Who is the Madonna of the streets? She wanders without a home, yet has the image of the mother of God. She governs both healing and people without homes. This young woman with a heart for the child of the street has caught the attention of a convent of nuns in Mission, British Columbia. She is illusive yet unforgettable, standing on the shore, disappearing into the woods. A nun of the convent has hidden her cloistered heart away, yet her visions of the Madonna bring her daily closer to the beloved. She has promised to leave her old life forever, taking us into the mystic divine. Her search for truth and authenticity takes us from the sacred moments of convent prayer, to the evening's beauty of an orchard grove, to the far reaches of Africa. 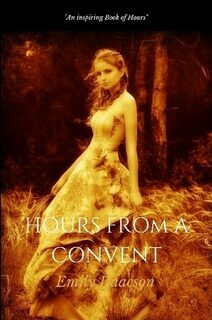 Hours from A Convent is a book of hours for sacred meditation, with elements of both mystery and incarnation. Emily Isaacson, poet, captures again in a timeless way, the beauty of prayer, contemplation, and creation. Her postmodern verse, in search of art and inspiration, is conformed to obedience to the gift. Both disciplined and profound, it measures light in form and verse, while pouring out the fine oil of the prophetic. She is sensitive to the times and seasons of nature and the spiritual earth.